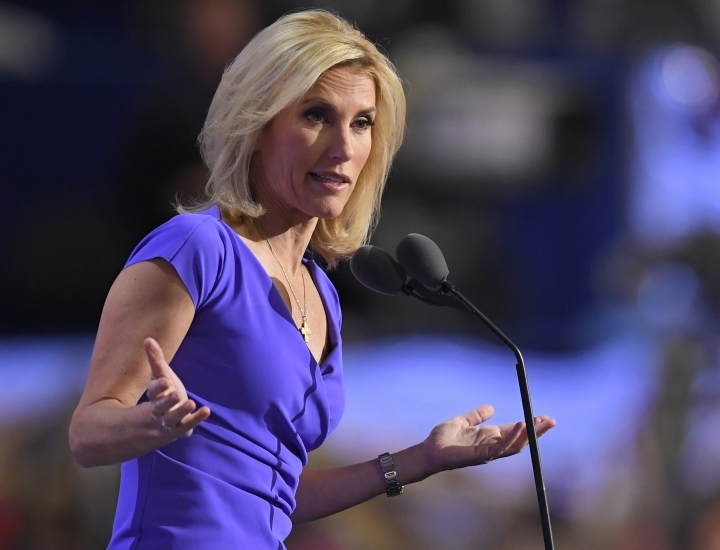 NEW YORK — Fox News Channel's Laura Ingraham is disavowing the support of white nationalists and claims her views about the nation's demographic changes have been distorted, although that hasn't quieted critics who see bigotry in her words. Ingraham said on Wednesday that "in major parts of the country, it does seem that the America we know and love doesn't exist anymore. Massive demographic changes have been foisted on the American people and they're changes that none of us ever voted for and most of us don't like." Shortly after, former Ku Klux Klan leader David Duke tweeted a link to what she said, calling it "one of the most important (truthful) monologues in the history of MSM." He later deleted the tweet. Ingraham said toward the end of Wednesday's commentary that she was not talking about race and ethnicity, and complained a night later that the disclaimer was being missed. On Thursday, she said she had "a message to those who are distorting my views, including all white nationalists and especially one racist freak whose name I won't even mention, you don't represent my views and you are antithetical to the beliefs I hold dear." Instead of race, she said she was talking about "a shared sense of keeping American safe and her citizens safe and prosperous. "I want to make it really clear," she said. "My concern will remain with the families who have suffered from the tragic results of illegal immigration." Still, MSNBC's Mika Brzezinski called it a "white supremacist speech" on Friday. CNN's Van Jones said that in discussing "demographic changes," Ingraham was clearly talking about race and ethnicity. "You dropped the dog whistle," Jones said on CNN. "You went with the megaphone. Now you're trying to pick up the dog whistle again. It's not going to work." Fox management has said nothing about Ingraham's remarks, and a spokeswoman said Friday that the network's top executive, Suzanne Scott, was not immediately available for an interview. Earlier this year, Scott told producers of Fox shows to do a better job keeping their on-air hosts and guests in line following a spate of controversial or offensive comments. It's not clear if she considers Ingraham's commentary in the same vein. With a prime-time lineup of Tucker Carlson, Sean Hannity and Ingraham, Fox has positioned itself to appeal to supporters of President Donald Trump, and frequently runs Trump's campaign rallies in full. The audience at Trump rallies is primarily white, and so it is for Fox: on average, its prime-time audience this year is 91 percent white and non-Hispanic, the Nielsen company said. MSNBC's audience is 69 percent white and CNN's is 57 percent, Nielsen said. Ingraham's commentary could have business implications among some advertisers who are already skittish about her since she tweeted about Florida school shooting survivor David Hogg whining about being rejected from colleges. Hogg, who has become a gun control activist, responded by calling on advertisers to boycott her show. Meanwhile, her viewership was up nearly 10 percent between the first three months of the year and the second three months, Nielsen said.